The island of Newfoundland contains 15 million acres of forest, of which more than nine million acres are considered productive. Most of these are located in the western and central areas of the island, representing 56% of the island's land area. In Labrador there are 13 million acres of productive forest, located mainly in the valleys of the Churchill, Alexis, Eagle, and Kaipokok rivers. Most of Newfoundland's productive forest consists of softwood species: balsam fir and black spruce. The hardwood found in the region is mainly white birch. Before the arrival of Europeans, the forest resources of Newfoundland and Labrador played a significant role in the material culture of Native peoples, who used fir and birch bark to make dwellings, storehouses and containers. They used wood to make tools, weapons and household items, and used forest products for food and for medicinal purposes. From the beginning of European exploration of Newfoundland, the main economic activity, the fishery, depended upon the resources of the forests. Both fishers and merchants in the migratory fishery needed wood to build flakes, boats, and barrels. They also cut wood along the shoreline for fuel and shelter, and to use as dunnage. Settlement, and the shift to a family-based fishery in the early 19th century led to the development of a small-scale forest industry, which was to expand into a major sector of the economy. Commercial use of the forests began gradually in the middle of the 19th century. Sawmills were established as populations grew. For example, in 1857 there were 14 mills clustered on the Avalon peninsula, the most densely populated region of the island. Mills also emerged in Notre Dame Bay on the northeast coast, in Trinity Bay, and in the Bay of Islands, on the west coast. By the mid-1800s sawmills began to emerge around the island. Courtesy of Archives and Special Collections (Coll - 137, 20.03.001), Queen Elizabeth II Library, Memorial University of Newfoundland, St. John's, NL. Virtually no legislation or policy existed at the time to regulate the forests or the uses of Crown lands. In 1875, the Crown Lands and Timber Act was passed, based on Canadian law, but it was never effectively enforced. A revised act in 1885 was intended to encourage an orderly and large-scale sawmill industry, which expanded as the railway was built after 1890. However, as it developed after 1900, the forest industry has been dominated by pulp and paper production. The first pulpwood manufactured in Newfoundland was at Black River, Placentia Bay, in 1897. At its peak, this mill produced 20 tons a day, but it closed in 1903. 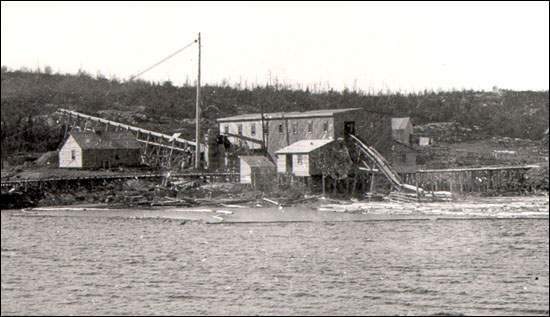 The Anglo Newfoundland Development (AND) Company's pulp and paper mill at Grand Falls was the island's second operation, opening in 1909. 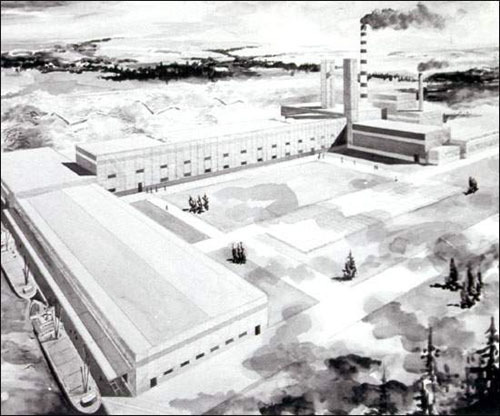 At the outset the Grand Falls mill produced 27,000 tons per year on three paper machines to supply the British market. It was later owned and operated by Abitibi Price, but operations ceased in 2009. 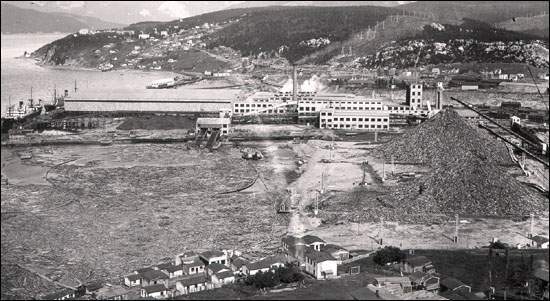 Another large mill was established at Corner Brook in 1925 by the Reid Newfoundland Company and other financial backers, under the name of Newfoundland Power and Paper Company, but was quickly sold off to the International Power and Paper Company. At one time the largest mill in the world, the Corner Brook operation, which Bowater-Lloyd took over in 1938, is still in operation today under the ownership of Kruger International. View of the town of Corner Brook with mill. Courtesy of Archives and Special Collections (Coll - 137, 16.03.001), Memorial University of Newfoundland, St. John's, NL. Operating under very generous agreements, the pulp and paper industry provided few direct returns for the Newfoundland government. Much of the companies' land was held freehold, which included rights to all water, mineral, and timber resources. On leasehold land, the companies paid a low annual rental. They did not have to pay stumpage on pulpwood. The largest contribution made by these companies to the Newfoundland economy, therefore, was through employment. The mills at Corner Brook and Grand Falls each hired more than one thousand workers from the outset. In contrast to the fishery and work in the woods, the jobs in the paper mills were steady and well paid. Workers responded to the new employment situation by unionizing. In Grand Falls, local 88 of the International Brotherhood of Paper Makers was established in 1910, and a local was formed in Corner Brook when the mill opened in 1925. Other workers associated with the pulp and paper industry joined locals of the International Brotherhood of Pulp, Sulphite and Paper Workers as early as 1913. The government made a few minor attempts to manage the resource, first through legislation in 1905 for fire suppression. In 1911 the Forest Protection Agency was established. The Commission of Government expanded this agency in 1934 to a Forestry Division with the Department of Natural Resources whose responsibility was to manage all unalienated Crown Lands. On the whole, however, in the period before Confederation Newfoundland did little or no forest management. With both the price and the consumption of newsprint reaching unprecedented levels, the 1950s was a prosperous decade for the pulp and paper industry, but by the 1960s mining surpassed forestry in overall importance to the Newfoundland economy. Although production of newsprint has remained stable since the 1950s, technological changes have resulted in fewer jobs in the woods and in the paper plants, and in some cases unionized workers have been forced to accept reductions in their wages to protect remaining jobs. In 1972 the Labrador Linerboard Company set up a plant to manufacture corrugated cardboard in Stephenville, using wood from Labrador. The operation was never successful, and the provincial government spent a great deal of money to support it. It was taken over in the late 1970s by Abitibi Price and converted to the production of newsprint. After attempts to manufacture corrugated cardboard failed, the mill was taken over a by Abitibi Price a few years after it was built and converted to the production of newsprint. Artist unknown. Courtesy of Archives and Special Collections (Coll - 75, 5.04.076), Queen Elizabeth II Library, Memorial University of Newfoundland, St. John's, NL. In the 1970s there was also a small resurgence in the saw-milling industry, and the government increased its efforts at forest management. However, conscious of high unemployment rates, successive governments have tried to maintain a balance between increased productivity and employment, on the one hand, and sustainable development and environmental concerns on the other. Thus, while some attention has been paid to reforestation and environmental controls, concessions have also been given to forestry companies to keep jobs in the province. As late as the year 2000, pulp and paper used 90% of the island's annual commercial timber harvest, and the two main companies, Abitibi Consolidated and Kruger International, controlled approximately 60% of the productive acreage. In Newfoundland and Labrador, as elsewhere, the economic climate made it increasingly difficult to regulate the industry.